A green tree snake made itself at home in the base of a blender so Mr Flack used a hair dryer to heat up the blender base, which encouraged the snake to move out of the tight space. Watch the video below. WE'VE all heard disastrous barbecue stories - raw meat, burnt snags - but if snakes send a shiver down your spine you may never look at Australia's favourite cooking appliance the same. 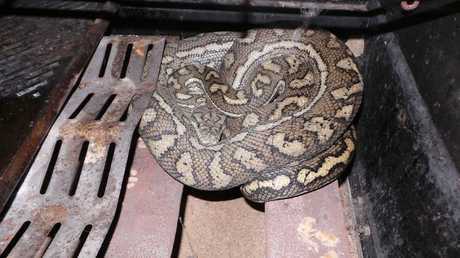 Bundaberg Snake Catchers David Flack was called out to relocate this 1.8m coastal carpet python after it made itself right at home inside a barbecue at a Delan home. Mr Flack said the home owner had been outside spraying a wasp nest when he came face-to-face with this non-venomous Aussie reptile. "The guy that owns the house rang me up and said he's got a carpet python in the barbecue. He said it was probably one that's been hanging around inside the ceiling for the past 12 months or so," he said. "He'd noticed a wasp nest nearby and was spraying that when he turned up the lid of the barbecue and spotted it there and wanted it removed. "It was between the grill plate and the top of the burners." 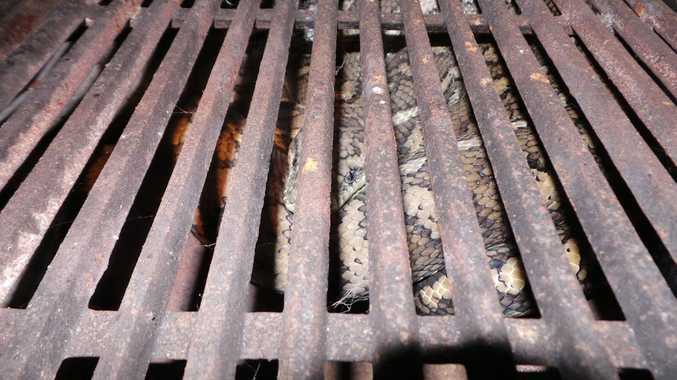 Mr Flack said he simply pulled off the grill plates and moved the snake out before putting it into a cotton bag and releasing it into the scrub. "Most snakes like cover so you won't usually see them out in the open unless they are moving between cover," he said. "In the wild they hide in hollow logs and in suburbia ceiling spaces, barbeques and compost bins and things like that. "Carpet pythons are nocturnal so during the day they prefer to be somewhere nice and dark." Mr Flack said it was now coming towards the end of snake season as the night temperatures began to cool down. "We're reaching the end of the hatching season now and they'll hide themselves a lot more now," he said. "They don't hibernate as such but they'll reduce that activity, so they find a nice little hollow and sit in there. They won't feed for the next few months and they might just come out and get a little bit of sun on a sunny day." While carpet snakes are non-venomous their bite could cause a nasty cut and bruise and Mr Flack urged anyone who found one not to attempt to catch it themselves. "People that have them around the house should leave them alone and if you're happy to have them hang out there they're actually doing you a favour by eating any rats or mice." Mr Flack has been working in the industry for about eight years and his skills are just limited to the slithering reptile variety.